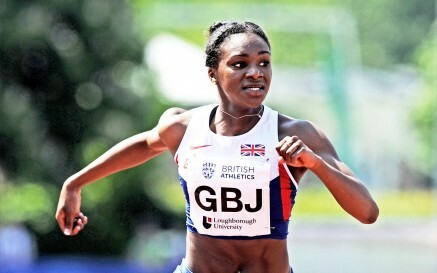 8th March 2015 – World Junior 100m Champion Dina Asher-Smith (GBR) made a big impact at the European Indoor Championships in Prague over the weekend. Having secured the British 60m title three weeks ago Dina went in being tipped for a medal, but at still only 19 years of age had to show a lot of mental strength and maturity to handle the pressure. She was in a class of her own in her heat and semi-final, winning both comfortably in 7.10 seconds. Other dominant winners were Dafne Schippers (NED) and Verena Sailer (GER) and those looked the three most likely to contest the medals. In the final Dina made a good start and headed the field at 40m. In the last 20m she was just unable to hold off the double outdoor European Champion Schippers but still crossed the line in second for her first major individual senior medal. Her time of 7.08 seconds was a PB, equaled the British record and set a new World Age 19 record to complete a very successful indoor campaign and means she can look forward with optimism to the outdoor season.